Purpose: To rehabilitate road connections between the Ethiopian border and Eritrean ports in order to boost trade and create jobs. 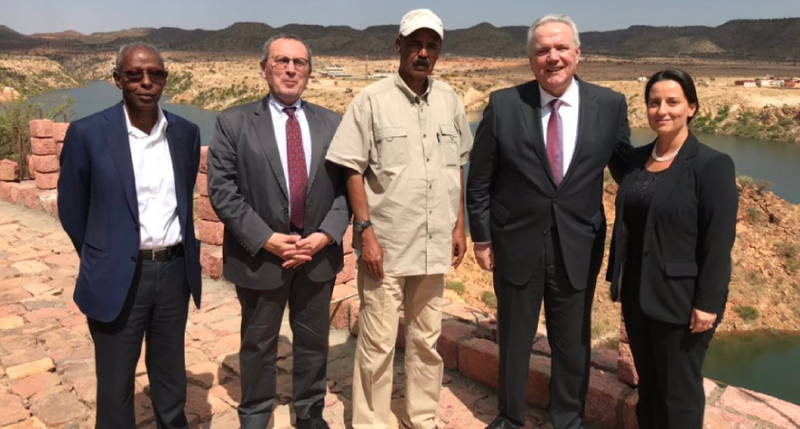 President Isaias today met EU Commissioner for International Cooperation & Development, Mr. Neven Mimica, and discussed Eritrea-EU cooperation ties within the framework of the recent climate of peace and cooperation ushered in the Horn of Africa, especially between Eritrea and Ethiopia. During his visit, Commissioner for International Cooperation and Development meets with the President of Eritrea Isaias Afwerki to discuss the situation in the region and explore ways for the EU and Eritrea to step up political relations and dialogue on matters of concern to both sides. The new project will be financed through the EU Trust Fund for Africa and through the United Nation’s Office for Project Services (UNOPS), according to a press release issued by European Commission. It will rehabilitate road connections between the Ethiopian border and Eritrean ports to boost trade and create jobs. This is the first phase of a broader support to Eritrea, which is planned to scale up later this year.